This 25-minute show teaches elementary students in grades K-6 about water, pollution and conservation. Our story opens in Dodge Ball City, where Sheriff Carrie Gooper is faced with a problem. The notorious Ron of The Cons has challenged Carrie to a showdown at high noon! But that’s not all – it seems there is also a water shortage. Could they be linked? Carrie seeks help from her friends Reginald the Cow and Blabby Daze to uncover the cause of the water shortage and to help back her up at the showdown. They inform her about the importance of drinking fresh drinking water and how to protect it. However, her friends are too afraid of Ron of The Cons so Carrie takes it upon herself to meet Ron alone. Carrie and Ron meet for their showdown, but after a nerve-wracking introduction, Ron informs Carrie that all he wanted to do was help her with the water shortage! He tells her we all need to conserve water to solve the problem. After helping Carrie learn about ways to conserve water, Ron appoints Carrie as an Official Environmental Deputy, and peace and order are restored in Dodge Ball City. 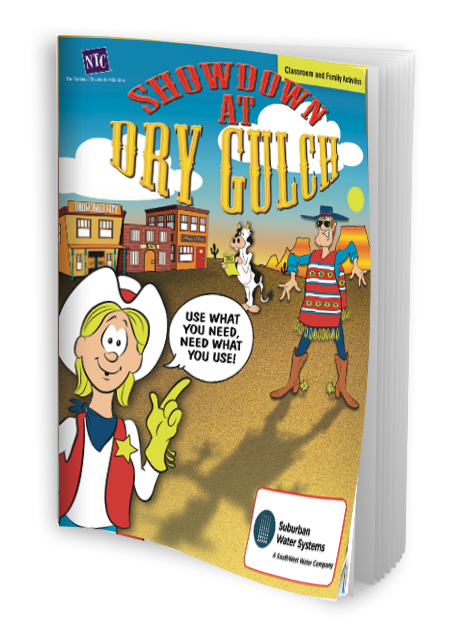 Showdown at Dry Gulch includes the live performance at your school, and supplemental online educational materials for the classroom. Showdown at Dry Gulch aligns with Next Generation Science Standards & Common Core English Language Arts Standards.